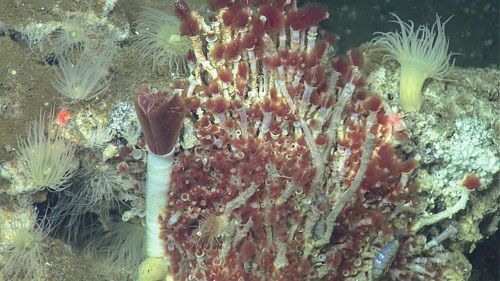 Diverse assemblages of invertebrate animals occupy the unusual habitats surrounding deep-sea hydrothermal vents, cold-water hydrocarbon seeps, and sunken whale carcasses. Great distances often separate these island-like habitats, and the resident species have effective modes of dispersal capable of connecting discrete populations often separated by hundreds of kilometers. Most of these invertebrates produce larval stages capable of dispersing in bottom- or surface-water currents, but their lifespans as larvae, the altitudes they achieve in the water-column, and the nature of ocean currents are frequently unknown. Population genetic studies allow us to bypass these unknown properties and indirectly infer rates of dispersal and recent historical connectivity between discrete populations. For some species, dispersal occurs in a stepping-stone fashion, from one habitat-island to the next, extending across thousands of kilometers. 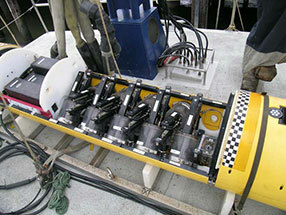 Yet for others, diverging ocean currents and structural features, such as differences in the habitat depths or large offsets in a ridge system, disrupt gene flow and lead to partial isolation or even speciation. Analyses of DNA sequences from nuclear and mitochondrial genes have allowed us to reconstruct the recent demographic history of species. 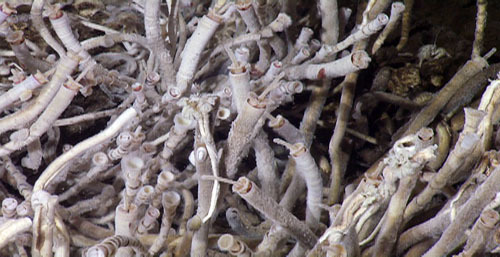 Rates of gene flow, geographical patterns of differentiation, and interspecific hybridization have been documented now for a number of deep-sea animals that live at vents and seeps. Peek, Andrew S., Gaut, Brandon S., Feldman, Robert A., Barry, James P., Kochevar, Randall E., Lutz, Richard A., Vrijenhoek, Robert C., (2000). Neutral and nonneutral mitochondrial genetic variation in deep sea clams from the family Vesicomyidae. Journal of Molecular Evolution, 50: 141-153.